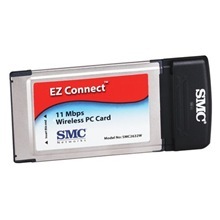 The SMC 11 MBps PC Card provides true wireless LAN networking for your notebook PC. The card supports up to 128 users on a peer-to-peer basis or connected through an existing network using the optional access point. Its operating range goes up to 1,500 feet. The new card is ideal for use with cable modems, DSL, and SOHO applications, and it provides guaranteed broadband compatibility with the optional access point. SMC2632W EZ Connect 11Mbps Wireless PC Card has 3 model (according to Part Number): * Where do I find my Part Number? "SMC SMC2632W EZ Connect Wireless PC Card_5V"
"SMC SMC2632W EZ Connect Wireless PC Card"